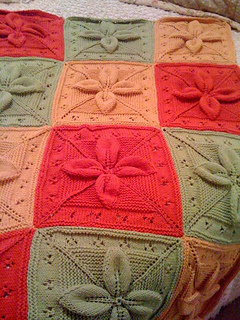 Today I’d like to show you a block that I’ve worked on for two years, and used in several afghan exchanges. 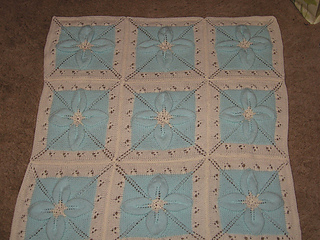 This block was originally featured in one of the Antique CounterPane guides; however, since I didn’t completely ‘create’ it, I offer it for free. 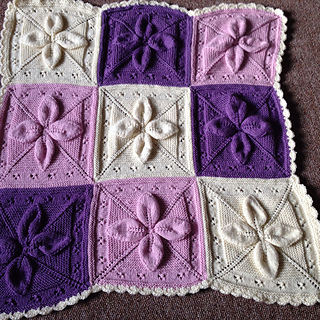 I see similar blocks featured in the latest issues of Mary Maxim’s catalogue. 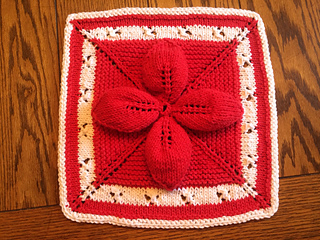 There is also one done in Jan Eaton’s 200 Knit Blocks, that has you make a single leaf, and join the four leaves in the corners, to make the four-leaf. That’s just too much work for me! This block is knit from the center-out on dpn’s. 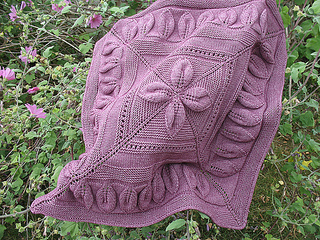 I do have a tutorial on Ravelry in my posts. Anyone interested in tutorial support feel free to PM me. I like to help you succeed in making your blocks!